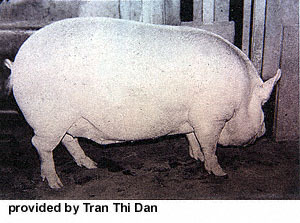 Thuoc Nhieu Pigs originated from crossbreeding between the Bo Xu and Yorkshire Pigs between 1930 and 1957. They are white with piebald bristles. They are dominant in sweet-water zones of the Mekong River delta in the southern part of Vietnam. Thuoc Nhieu Pigs prolificacy is average, at 8 -10 piglets born alive per litter. They are well known for their good mothering ability. The live weight of 100 kg can be reach at 10 months of age.